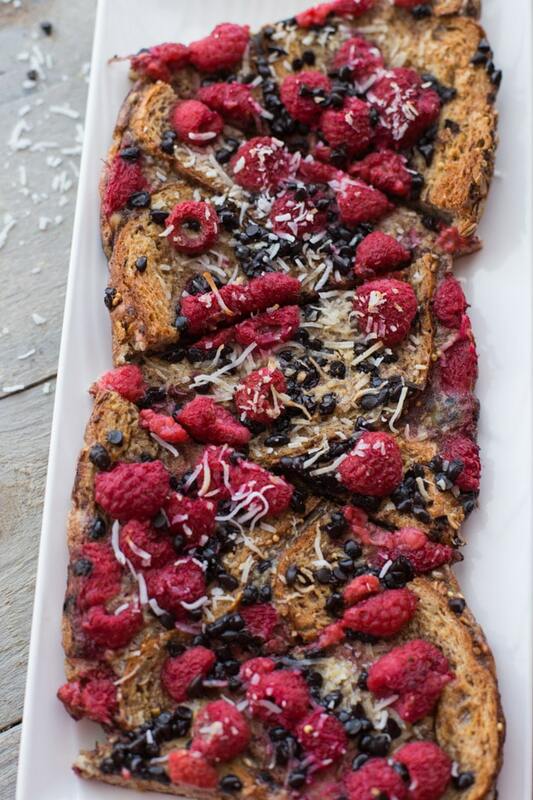 I have some holiday breakfast inspiration for you today – Raspberry Dark Chocolate French Toast Bake! I know I’ve said this before, but isn’t breakfast the best meal of the day?! And I don’t know about you, but when I try something new for breakfast, I get stuck on it for a few days and wake up every morning craving it. Last month, it was this sweet potato breakfast skillet. 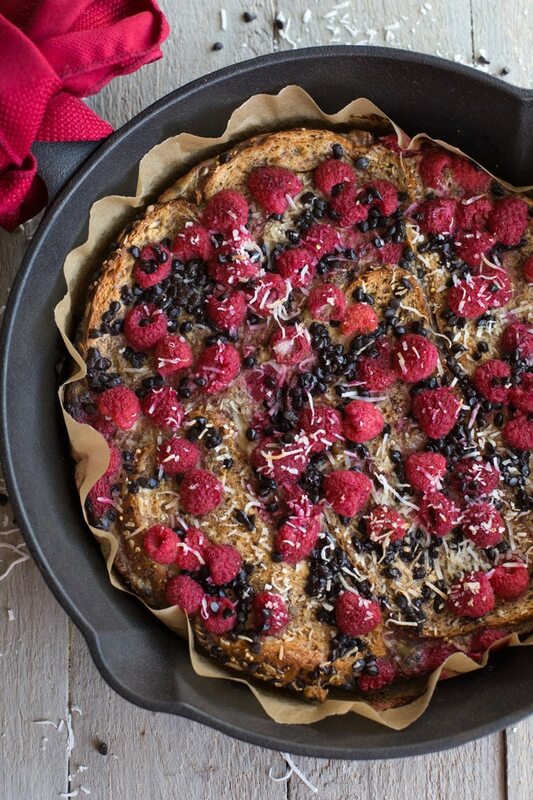 This month, it’s all about this Raspberry Dark Chocolate French Toast Bake. It’s easy, clean eating and festive…..so really, it’s just the perfect holiday brunch dish! We had our 4-year old nephew sleep over last weekend, and I made him french toast for breakfast, which he totally loved with strawberries and maple syrup. A lot of maple syrup! 🙂 So after he went home, I was totally craving french toast. But not just a plain slice prepared in the frying pan. I wanted a clean eating, fruit-topped french toast bake that I could assemble, put in the oven and forget about for 30 minutes. Okay, I may have had some of those ingredients in my cupboard already, but the fresh raspberries and protein bread were absolutely essential to my plan! So a grocery store trip was totally necessary. The bread is a thinly sliced protein bread that I found at our local grocery store. As I’ve mentioned in previous posts, I try to limit my bread intake, but I found this protein bread really works for me. I love how this french toast bakes up in the skillet. The slices of bread fit perfectly (I didn’t have to cube or cut it), and the egg mixture bakes up around the bread to form a perfect pie shape. When it’s finished baking, you just need to lift it out of the skillet and cut it into pieces, just like a pie or pizza 🙂 . You had to know this was coming, but I love the mini dark chocolate chips sprinkled on top. 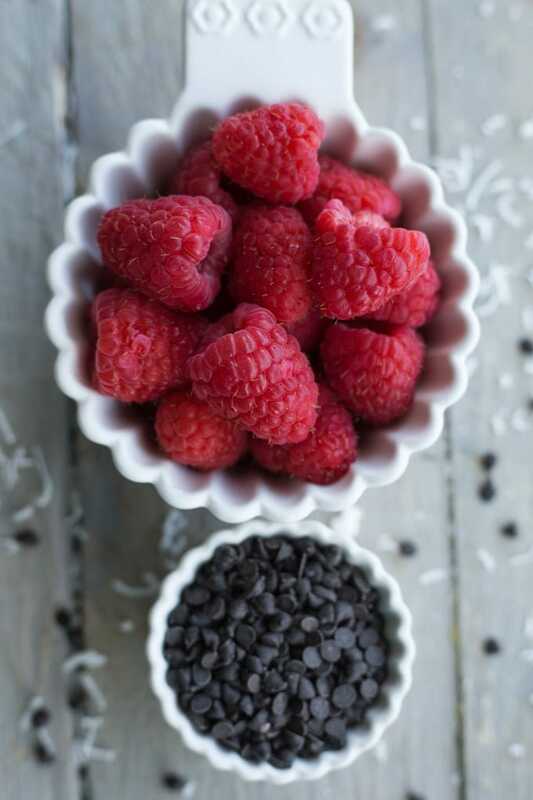 It’s the decadent touch for this dish, and let’s be honest, you can’t have raspberries without dark chocolate! And, perhaps the best part is that you can make this dish ahead of time! 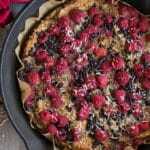 Just prepare the bread and egg mixture in advance and add the raspberries, chocolate chips and coconut before baking. Easy peasy! I know it might be a bit early to start thinking about your Christmas morning breakfast, but this Raspberry Dark Chocolate French Toast Bake should be a definite contender. While you can enjoy this french toast with some whipped cream, to keep it clean, you can serve it with some yogurt and a drizzle of maple syrup. I use Skyr yogurt, which is a thick and creamy Icelandic yogurt, and just stir in a little bit of maple syrup, vanilla extract and cinnamon. Super delicious! If you like this recipe, feel free to share on Facebook and Pinterest! 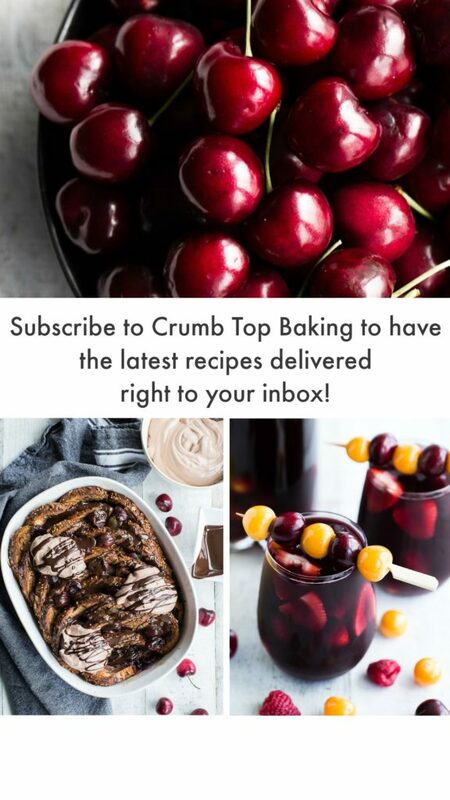 And if you make it, snap a pic and share on Instagram by tagging @crumbtopbaking. Raspberry Dark Chocolate French Toast Bake is a quick and easy breakfast bake, perfect for your busy Christmas morning and holiday brunch gatherings. Pre-heat the oven to 400 degrees and line a 12-inch cast iron skillet with parchment paper. 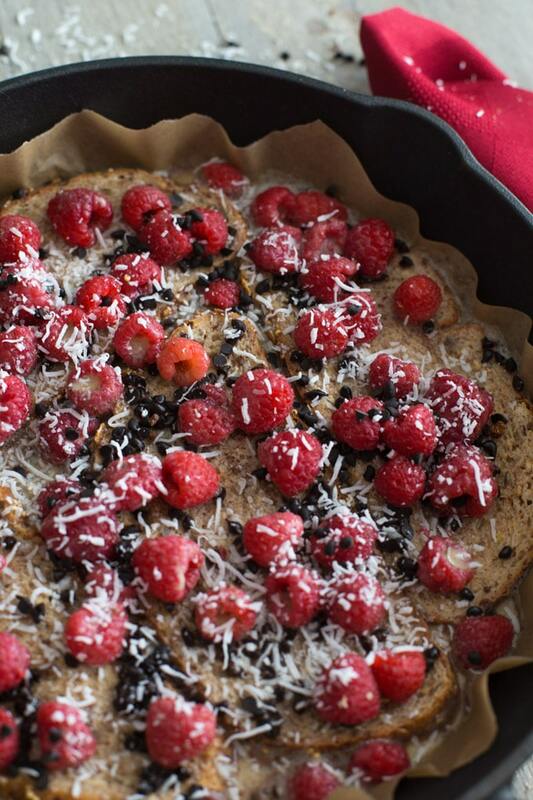 Arrange the bread slices in the skillet in a single layer (no need to cube or cut up the bread) and then sprinkle on the raspberries, chocolate chips and coconut. In a medium-sized bowl, whisk together the eggs, almond milk, vanilla, cinnamon and nutmeg. (The spices may not fully combine with the eggs and milk, but don’t worry about this). Pour the egg mixture evenly over the bread and toppings. Bake for 25-30 minutes, or until the edges have browned and puffed up. Remove from the oven and let sit for 5 minutes. Use the edges of the parchment paper to lift the french toast bake out of the skillet. Place on a cutting board and cut into 8 pieces. Serve with a spoonful of yogurt or whipped cream and some maple syrup and additional coconut. The protein bread is President’s Choice brand, and includes a grain and seed mix as well as chickpeas. So it still has fibre, but also has lots of protein. When I crave toast or a sandwich, this is my go-to bread. You can also turn this french toast bake into a make-ahead breakfast/brunch dish. 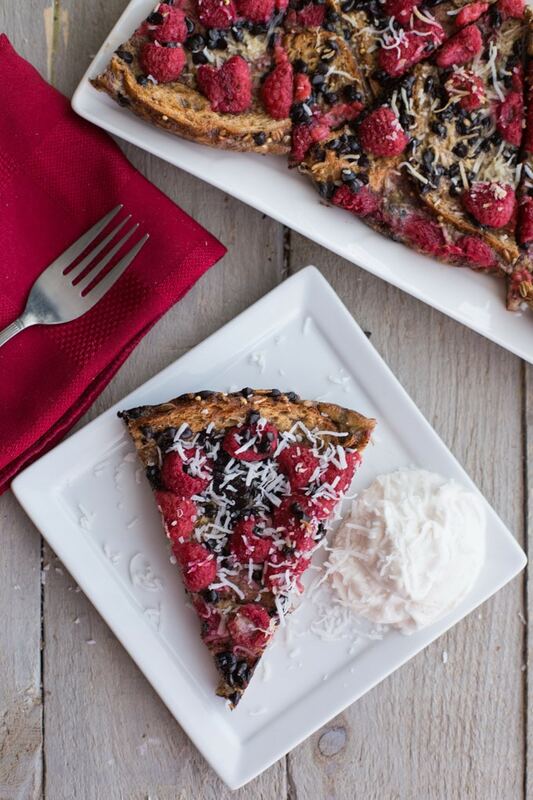 The night before, just arrange the bread in the prepared skillet (leaving off the raspberries, chocolate chips and coconut) and pour on the egg mixture. Cover and store in the fridge. In the morning, pre-heat the oven to 400 degrees and add the raspberries, chocolate chips and coconut to the top of the bread. Bake for 30 minutes, or until the crust is browned. (You may need to bake it for a few extra minutes to account for the bread soaking in the egg mixture overnight). I’ve also made this french toast bake with frozen blueberries and it worked out well. Just note that if you don’t defrost the fruit, you may need to bake the french toast for a few extra minutes. Also, if you use blueberries, you may only need one cup. I found 2 cups was a bit too much. Thank you! I have big plans for this French toast during the holidays! It will make an appearance at breakfast and brunch for sure! Whenever I am anywhere and in a position to order breakfast, 9 times out of 10, I order French toast! This is a dreamy breakfast! Thanks Annie! French toast is one of my favourite breakfasts, and I always treat myself to lots of it over the holidays! Maybe its the maple syrup and red berries, but it feels so festive! Enjoy the rest of your day!